The Occupation era (1945-1952) witnessed major change in Japan and the beginnings of its growth from of the ashes of defeat towards its status as a developmental model for much of the world. The period arguably saw the sowing of the seeds of the post-war flowering of what some term the ‘postwar Japanese economic miracle’. However, some scholars dispute this position and argue that the Occupation's policies and impacts actually hindered Japan's recovery. This volume addresses this question and others surrounding the business and economic history of this crucial period. 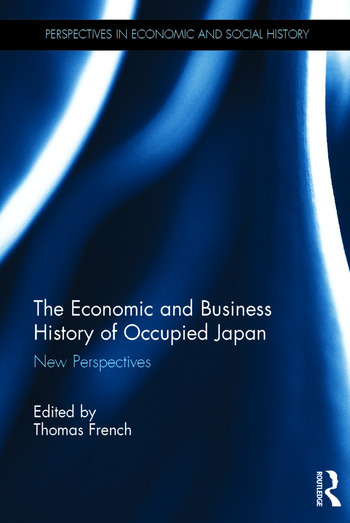 The chapters presented in The Economic and Business History of Occupied Japan are authored by major scholars of the Occupation from the U.S., Japan, and Europe. The chapters are divided into three sections: 'Planning, reform and recovery', 'Industries under the Occupation', and 'Legacies of the Occupation era'. Following an introduction focusing on the historiographical background, the first section examines zaibatsu dissolution and its significance, the role of Japanese businessmen within the Occupation's reforms, the crucial impact of Japan's postwar Materials Crisis, and the impact of reform at the local level in Hokkaidō. Part two looks at a number of individual industries and their development during the era, including the fishing, automotive, and cotton spinning industries. The final section looks at the human impact of the changes of the initial postwar years, including the reintegration of repatriates into the Japanese labour force and the impact of changing working patterns on society and family life. This book covers a key period of the economic and business history of Japan and presents numerous new approaches and original contributions to the scholarship of the Occupation era. It will be of interest to scholars of modern Japan, economic history, business history, development studies and postwar U.S.-Japan relations. Thomas French is an Associate Professor of Modern Japanese History at the College of International Relations, Ritsumeikan University, Japan. He is a specialist on the Occupation of Japan, and his broader research interests include U.S.-Japan relations, the Japanese automotive and arms industries, and the Japanese Self Defence Forces.